There have been a number of periods when proposals for new or different United Nations structures were proposed. The first period was in 1944-1945 when the U.N. Charter was being drafted. Some who had lived through the decline and then death of the League of Nations wanted a stronger world institution able to move more quickly and effectively in times of crisis or at the start of an armed conflict. In practice, the League of Nations was reincarnated in 1945 in the U.N. Charter, but the names of some of the bodies were changed and some new Specialized Agencies such as UNESCO were added. However, there was some dissatisfaction during the San Francisco negotiations and an article, 109, was added indicating that 10 years after the coming into force of the Charter, a proposal to hold a U.N. Charter Review Conference would be placed on the agenda – thus for 1955. The possibility of a U.N. Charter Review Conference led in the 1953-1954 period to a host of proposals for changes in the U.N. structures, for a greater role for international law, for a standing U.N. “police force”. Nearly all these proposals would have required modifications of the U.N. Charter. In the United States, the Senate created a Subcommittee on Review of the U.N. Charter which held hearings for two years. The Subcommittee created a precedent by traveling all over the country to get local views. Its testimonies filled two thousand pages of the printed record. I have them as a bound book, and it is interesting to read the views expressed at the time. When 1955 arrived, the United States and the Soviet Union, both of which did not want a Charter Review Conference which might have questioned their policies, were able to sweep the Charter Review agenda item under the rug from where it has never emerged. In place of a Charter Review Conference, the governments in the U.N. created a U.N. Committee on “Strengthening the U.N. Charter”. The Committee made a number of useful suggestions, none of which were put into practice as such. Kofi Annan, who had spent his career in the U.N. system first in Geneva and then in New York, created a number of these expert groups such as the High Level Panel on Threats, Challenges and Change. In addition as Secretary-General he organized for 2000 a Millennium Assembly and a Peoples Millennium Assembly which brought together many of the world’s head of state which adopted the Millennium Declaration and the Millennium Development Goals. The Peoples Assembly was also held at U.N. headquarters in New York and brought together 1400 NGO representatives which drafted our own Declaration and Action Plan which was sent to all U.N. Member States. Another Peoples Assembly was held in Apia, Samoa in April 2000, organized by the Millennium Peoples Assembly Movement, the first of what was hoped at the time could lead to an ongoing Second or Peoples House at the U.N. However the effort did not have the organizational resources or skills to continue. Personally, I tend to have a dim view of formal structural changes given my own experience working on human rights issues. The change in structure from the Commission on Human Rights to the Human Rights Council opened the door for governments to lessen the role of NGO representatives and independent experts. Thus, while I see the need to improve the functioning of U.N. bodies, I see the way forward by an improvement in the quality of government delegates, U.N. Secretariat members, and the quality of NGO representatives. 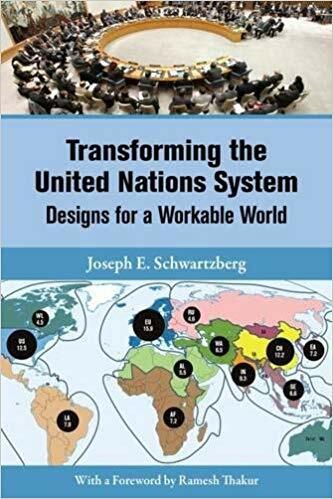 Nevertheless, Joseph Schwartzberg’s book is an essential reference work for all those concerned with structural changes in the way the U.N. functions and the role of the U.N. within the wider world community. I would suggest reading the concluding chapter first “Getting There” as I am not at all sure that government thinking is ready to make any deep changes. However, the most complete reform proposals have just been issued for discussion at the U.N. by the government of China in a 27-page document. Many of the proposals are very similar to suggestions made by the Association of World Citizens. Unlike Schwartberg who has carefully footnoted all his references, the Chinese text has no footnotes as to what documents were read before writing the paper, so we will not suggest that the Chinese Foreign Ministry “borrowed” our ideas. We can only say that great minds go along in the same avenues. The Chinese proposals merit close attention. However, unlike world citizen proposals, the role and capacity for action of NGOs is never mentioned. It is a very “State-centric” document – to no great surprise. However, for those like me, who like to have a plurality of ideas expressed in any major undertaking, the Schwartzberg book is a well presented discussion, major structure by major structure – General Assembly, Security Council, ECOSOC, Specialized Agencies and Programmes – proposals on which we can draw for fruitful dialogue. The U.N. is dysfunctionally corrupt as organisation. National governments under the garb of national interest lance their private candidates for U.N. jobs esp. those of the developing and least developed countries. Ambassadors swarm around U.N. DG’s, ministers plus of higher political powers vie the Secretary-General for jobs esp. whe a new UNSG is elected. There is no quality capability as objective principle for any job. One washes the hand of the other. The U.N. management has no credibility anymore, if it ever had one. Apart from cases paying underhand or sexual propitiatory fulfilment for U.N. job rewards at general service levels have been heard not seldom, as passing norm. Scandals of all kinds make their run in this organisation including bids from extraneous servicing companies catering the U.N. While the U.N. remains as emergency valve as a meeting place for warring partners, most real world control of events and transactions are done outside of the U.N.